Summertime is prime time for many flowering plants. The hummingbirds, bees and butterflies flock to the blossoms and brighten the garden with their antics. Plant a variety of flowers that span the warm months of summer, from June to September. Nearly any profusely blooming plant will attract hummers; here are a few favorites that attract the tiny birds to the garden. The salvias are a wide group, with plants that range from ground covers to large shrubs. There's a Salvia for nearly every climate, soil type and sun exposure. The flowers range from white to red to blue to dark purple. In addition, salvias are deer resistant (though nothing is completely resistant to a hungry deer in winter). While local venders have common Salvia varieties, online resources include Flowers By The Sea, a small nursery in Elk, California. 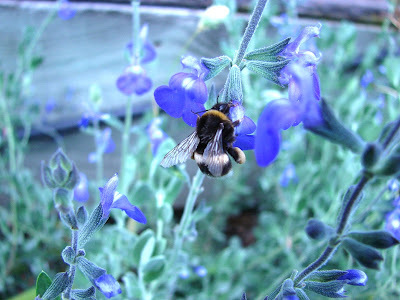 The website allows gardeners to search for salvias by color, season, zone and has a plethora of information about salvias and companion plants. A courtyard or small garden may be limited in space, but there's nearly always room for a vine to clamber over a wall or fence. 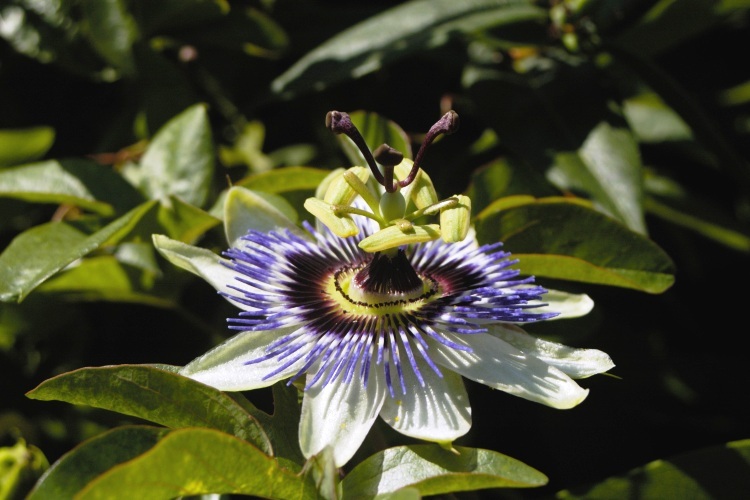 Passionflowers produce a multitude of flowers through the summer, which develop into orange fruits in late summer and fall. Native to South and Central America and Mexico, passionflowers are hardy in USDA zones 8 through 10. In colder climates, grow passionflowers as annuals or in containers that can be moved indoors. Hummingbirds love the ornate flowers of the passionflower and with 30-foot vines, the plant can keep the tiny birds working the flowers all day through the summer. Hummingbird magnets suitable for hanging baskets include fuchsias, lipstick plant, nasturtiums, petunias and plumbago. The bright colors and easily accessible blossoms attract hummers. 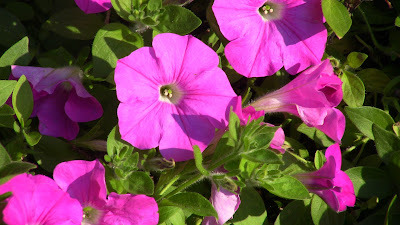 Add a basket of four-o'clocks for evening antics while you enjoy a beverage on the patio after a hard day at work. Next time In the Garden, I'll talk about fall flowers and ways to supplement your local hummingbird's diet through the cold winter months. If you missed the Spring-flowering Humminbird Magnets post, you can find it here. Great information, Ruth. My hummingbirds love my Foxglove and lilacs. Today on #OurAuthorGang, Ruth de Jauregui gives us the second installment of her series on flowers that attract hummingbirds. Great post, Ruth. Those flowers are gorgeous. Hummingbirds are awesome. Saw slow-motion film footage on a PBS Nature show, of a hummingbird feeding -- and it never stops flapping its wings. Awesome! My contribution to #OurAuthorGang today. Here's the second post of my series on flowers that attract hummingbirds. I just love, love, love the tiny birds! I love your gardening posts, Ruth! I saw a few hummers around my bloomed coleus this summer. I'm so excited September is here and those beautiful fall colored mums are everywhere! Thanks for the great information! Thank you!! I'm sure the hummingbirds love your garden! Since I rent, I'm limited in what I can plant right now, but I planted fruit trees, herbs, and passionflowers at my old house. The hummers and native bees were all over the flowers. Thank you so much. They're my favorite bird! Another great post Ruth, very informative. I really wish we had hummingbirds in the UK, they are so beautiful. I adore hummingbirds!! Thank you! I love the salvias and there's literally something for everyone, including white sage for those who want to plant a space for meditation and/or spiritual practices. Your knowledge on these flowers is expansive. I find this so informative for those who want to attract hummingbirds, such as myself. Thank you for posting. I look forward to your next post. Thank you! I've been studying up on hummingbirds and flowers for my next garden book, which is still in the outline stage. +Ruth de Jauregui Sounds wonderful, Ruth. They are such interesting birds.